For larger parties, please see complete price table below. This full-day, private tour takes you into the desert north of Salalah in search of the lost city of Ubar, the "Atlantis of the Desert." You will be met at the port by your private guide to begin your tour. Leave Salalah northwards by four-wheel drive and head into the stone and sand steppe of the Rub Al Khali (the Empty Quarter), the largest sand desert in the world. First we will make a stop at the famous Bedouin village of Thumrait. 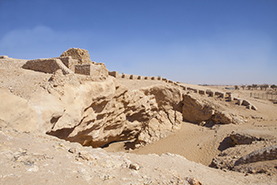 Then we will head west across the gravel desert of Al Nejd to the site of what many believe is the legendary ancient kingdom of Ubar, which was romanticised in the stories of 1001 Nights. In the Koran, God caused the city to sink into the desert for its godless behavior. It’s more likely Ubar lost its importance because of the desertification of the area and was swallowed up by centuries of shifting sands. Remains of this ancient city were located by satellite imagery and excavation began in the 1990s. Continue into the Empty Quarter to explore. Then settle down for a typical Arabian picnic lunch among the dunes. Then you will be transferred back to the port in Salalah to rejoin your cruise. • One bottle of water per person.